SAN LUIS OBISPO — Cal Poly’s Army Reserve Officer Training Corps’ class of 2017-18 — one of the largest in the university’s recent history — is among the top student groups in the nation. “We had the fourth-highest average cadet order of merit scores among 281 U.S. colleges and universities across the country that have ROTC programs,” said Capt. Dominic Senteno, an assistant professor of military science in the university’s military science and leadership department in the College of Agriculture, Food and Environmental Sciences. “That also includes senior military colleges such as Texas A&M, Virginia Military Institute and Valley Forge Military Academy and College, and Virginia Military Institute. The group of two women and 12 men is also one of the largest. While Cal Poly’s ROTC program attracts between 65 and 70 cadets a year from all six colleges, typically only eight to 10 graduate annually and are commissioned as second lieutenants. The order of merit score is based on leadership skills, physical fitness tests and cumulative grade point average. Cadets are assessed at the beginning of their senior year, and this assessment plays a key role in where they start their military careers. All 14 students receiving commissions this academic year received the component choice in the Army they desired. Nine chose active duty assignments, four are bound for the National Guard and one selected the Army Reserve, Senteno said. Six of the cadets were designated as Distinguished Military Graduates, individuals who rank in the top 20 percent of some 6,000 Army ROTC graduates nationwide. Connor Flora, 22, an architectural engineering major from Seattle, said the esprit de corps among cadets contributed to Cal Polyearning the national OMS ranking. Classmate Nathan Dagley, 22, an anthropology and geography major from Aliso Viejo, was proud of his peers’ efforts and of the lifelong bonds he forged. Dagley is going to be a military intelligence officer in the Army Reserve. The Army’s ROTC program celebrated its centennial in 2016. As full-time college students, ROTC cadets simultaneously pursue a bachelor’s degree while taking military science classes and participating in field exercises and labs that prepare them to become officers in the U.S. Army. Cal Poly launched a voluntary Reserve Officers' Training Corps program in the fall of 1952 during the Korean War. The first class of ROTC officers was commissioned in 1955; more than 1,300 officers have been commissioned over the ensuing 63 years. Capt. 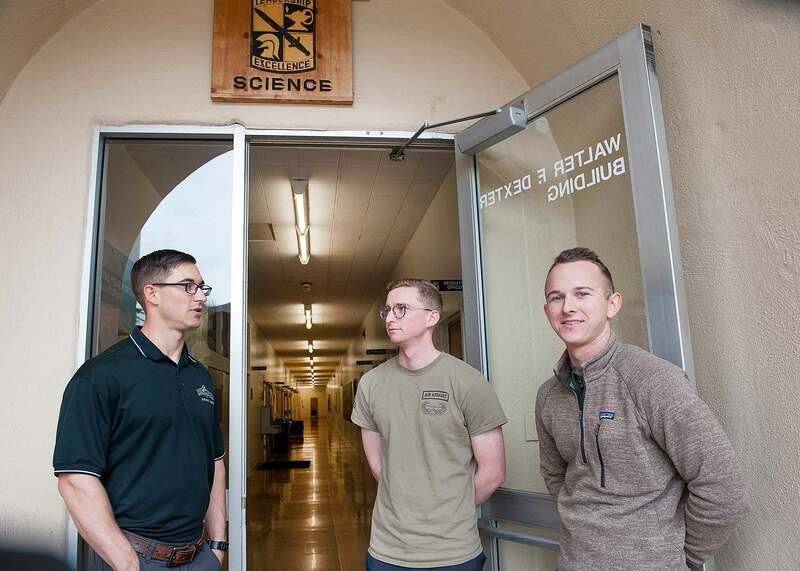 Dominic Senteno (left), an assistant professor of military science in the university’s military science and leadership department chats with cadets Nathan Dagley (center), 22, an anthropology and geography major from Aliso Viejo, Calif., and Connor Flora, 22, an architectural engineering major from Seattle. Photo by Jay Thompson, Cal Poly University Communications.